This blog is a personal blog written and edited by me. All products are purchased by me, with my own money, unless stated otherwise. All opinions on this blog are purely my own, based on my experiences with said product. This blog does not accept any form of cash advertising, sponsorship or paid topic insertions. However, this blog does occasionally contain affiliate and referral links, which may earn me commissions or free products. These will always be labelled in each post. All advertising is in the form of advertisements generated by a third party ad network (Google Ad Sense) and compensation received will never influence the content, topic, or posts made in this blog. The owner of this blog will and does accept free products to review, but will always be honest and provide a 100% honest review, based on personal experiences. If a product is not enjoyed, the brand or company will not be discredited, and the owner will never accept compensation to provide a positive review. This blog does not contain any content which might present a conflict of interest. A contact me form is available in the right hand side bar as well. 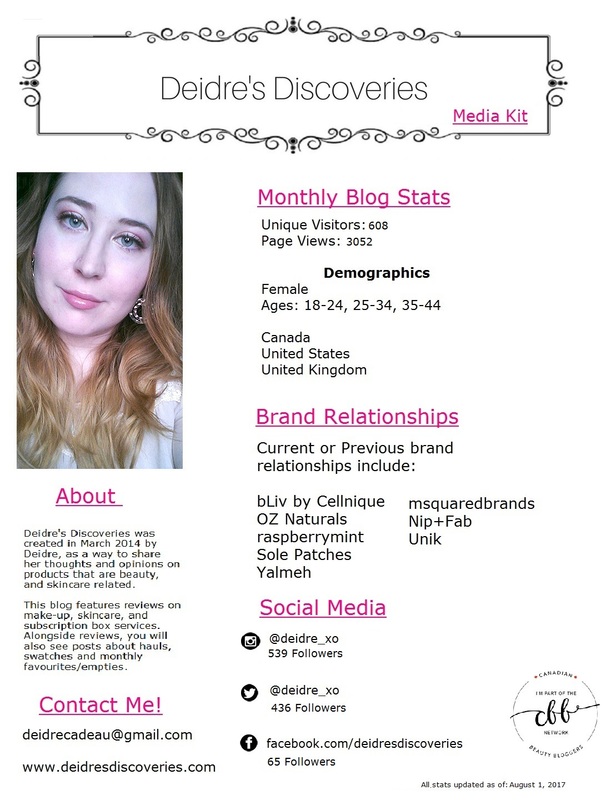 I would be happy to review your product and/or subscription box on Deidre's Discoveries. I do try my best to provide my reviews in a timely matter (within 2 weeks of receiving the product) however some products may take longer to review. As mentioned above, I do provide honest opinions and thoughts on the products I do review, and some products do need longer than 2 weeks to provide that honest opinion. If this timeline does not work for you, please let me know and I will work with you. Please contact me at deidrecadeau@gmail.com to discuss this further. A contact me form is available in the right hand side bar as well.